A few years ago I went to my one and only cigar event, a Cigar Aficionado Big Smoke evening at the Venetian Resort on the Las Vegas strip. I waited in the lines, met a few cigar stars, and went home with my swag. It was a good time, but not anything I’d go out of my way to do again. Crowds and noise are just not my thing. But I do have one outstanding memory from that nicotine-powered, liquor-soaked evening: in the stygian gloom created by hundreds of cigar smokers a stout gentleman walked by me as I was waiting in line (a mob, really) at the La Aurora booth. He was smoking something so distinct and powerful that the aroma found a way through the thick cloud in the room to my nose, which was tickled and might have even twitched. I followed him around the corner and when he stopped to chat with someone I discreetly peered at the cigar in his left hand: an Oliva Serie V.
And I thought, Wow. That’s one I’m going to have to try. In the four years or five years since then, the Oliva Serie V has become a staple in my humidor. I’m wary of its potency, which is a little outside my comfort zone, but I’m willing to smoke them slowly and carefully in exchange for the intensity of their flavor. One way to mellow a powerful cigar is to stash it away. And though I have come to the conclusion that most cigars do not benefit greatly from aging, there are a few exceptions, and those exceptional sticks are all fairly strong blends. So when I opened the humidor and spotted an Oliva V Lancero with yellow cello and a 2008 sticker on it, I had to give it a go. We found some problems with cracking wrappers in our original review of the Serie V, but I have never experienced that with the lancero. In fact, I have experienced no construction issues with the lancero at any time, not even the occasional tight draw to which cigars with narrow ring gauges are prone. And this one was no different. Four years in hibernation have mellowed this cigar to an appreciable degree, but the blend is robust enough by design that it is “mellow” only by comparison with the original article. It begins with a cool and creamy demeanor, gradually heating up as the familiar flavors start rolling in: sweet smoky hardwood and leather in balanced proportions. The mid-section adds a dose of cocoa which slowly turns darker and more roasted in flavor, eventually coming to resemble espresso or dark roasted coffee. The last stage is peppery, but it’s not quite as explosive as it once was. There is also an unusual aftertaste to this cigar that I always enjoy — it’s earthy, but slightly herbal, almost like basil. This slight-looking parejo still makes me a little weak in the knees when the cinder meets the band. The years have slowed the Oliva Serie V lancero down a bit, but not all that much. It’s still a brilliant cigar, and a great candidate for aging. 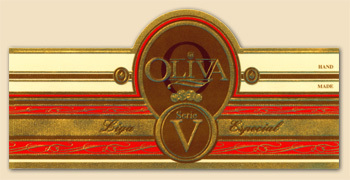 By an odd coincidence, Oliva just announced a new extension of the Oliva Serie V — the Oliva Serie V Melanio, which will feature a Sumatra seed wrapper grown by the Olivas in Ecuador. The only thing I’m not looking forward to is the price — $8 to 14, their most expensive offering to date. Time to raid the piggy bank again. Interesting for you to conclude that most cigars do not benefit from aging. “Many” would have been the less provocative word. Sometimes it is not clear to me whether there is a benefit. E.g. 4-year old maduros that are wonderfully smooth etc. may please me, but the specific taste of a much younger maduro wrapper is certainly missed though the cigar as a whole is good. Anyway, thanks for the review. When the Vs came out, I got some at an event at Atlantic cigar. They were way too strong for me, & as you did, I put most of them away for me to build up my tolerance for them as well as for them to mellow a bit. When I smoked them years later, I concluded the flavor was not dynamic, that powerhouse strength was being taken for much more than what it was (by smokers caught up in a fad). However, powerhouses & overly fat cigars proved to be more than a quick fad–so what do I know. I try to be careful about the aging issue because I respect the opinion of those who insist that age improves tobacco, especially Habanos. But my personal experience, based on aging all kinds of cigars across the spectrums of national origin, strength, and price, is that there is one consistently observable effect — they get weaker. Sometimes that’s a good thing, but more often it isn’t. I happen to agree with your wording, and don’t find it provacative at all. After all, it’s an opinion, and we all have our own. As with wines, I believe that most non-Cuban cigars are meant to be consumed upon purchased, and are made with that in mind. A few may benefit from aging (as opposed to resting), but the vast majority will simply lose a lot of what made them attractive in the first place. As with anything subjective, it’s all in the perception of the beholder. I love the Serie V lancero and No. 4 and don’t find them to be particularly strong, just full-bodied/full-flavored – not a faddish power over flavor line at all. Haven’t had an aged one, though. I would definitely buy them by the box, if finances allowed. Oliva is a high quality brand and a great value. Thanks for the review mate, glad I just purchased a box of these and looking forward to it. I’ve smoked the figurado and found it to be aging well, I have one in my humidor from 2008 I may light it up tonight to see how it goes. I love the Series V! It’s such a great blend. I love the lancero vitola as well that cigar is an all around winner. I totally agree about aging potent cigars, it definitely calms them down a little and lets them mellow into a nice pleasurable stick! i also have some series v from 2008. Basil! My God, you nailed it! I was trying to find the right description. I would even qualify further and say PURPLE basil, but it’s there! Smoking a 2yro double robusto right now.